Torah Scribe in Israel | Get the Word Out! Masada is home to some excavated ruins of a synagogue. 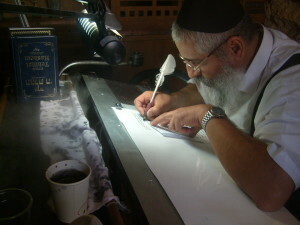 Inside the synagogue was a Scribe who was copying the Torah by hand. You can faintly see the steam that was continually over the parchment to keep it from cracking. Scribes must memorize approximately 4000 Jewish laws, and all of the letters (Hebrew reads from right to left) must be the same size; none of them may touch another. If mistakes are made, the parchment must be disposed of. It was fascinating to watch!